From conferences to concerts, live event coverage is becoming an integral part of most brands’ ability to grow their social footprint and share with their audiences in a relevant way. Covering an event humanizes your brand and allows them to see you care about the event just as much as they do. In an age where consumers are choosing like-minded brands, live event coverage can drive business, brand loyalty and trust. Your strong social presence during an event can increase customer service for those attending, allow your brand to monitor risk and mitigate issues that may arise, curate updates to event information and more. With event coverage, it’s all about the details. Consistent use of hashtags, intriguing behind-the-scenes visuals, engaging with the artist or event partners, showcasing exclusive action your followers might not have an opportunity to see…the list goes on and on. Additionally, real-time engagement with your audience puts your brand in the same space as them, cultivating a peer-to-peer relationship. We’ve compiled a list of our favorite tried-and-true tips to help elevate your live event coverage game. We all have that friend who posts 49 raw videos from the concert they attended last night. Don’t be that friend. People want a glimpse of your event – a peek behind the curtain or the inside scoop. They don’t need to see the entire show. Limit your Instagram or Snapchat stories to just a handful of posts. Focus on taking great photos and post them in real time as you create content from the event. Also, video elements in some capacity are a must. Every day, social platforms are giving more priority to video. With Facebook Live, Instagram Stories, IGTV, Boomerang and more, you have options. Utilize a short and sweet event hashtag for Twitter and Instagram. Take time prior to the event to brainstorm a clever hashtag that is both eye-catching and conscious to your character count. A good example comes from our friends at Riverwind Casino. 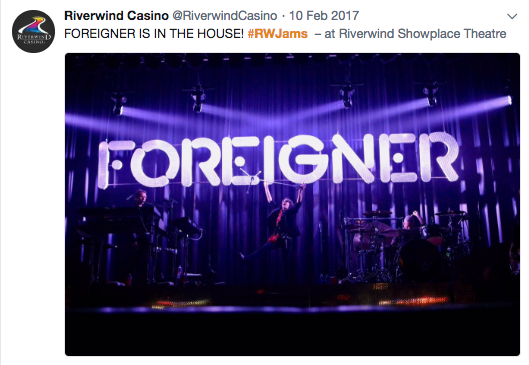 Working together, we developed the hashtag #RWJams, which is used for events inside the Showplace Theatre. This allows their audience to keep track of all the great entertainment that comes to town. 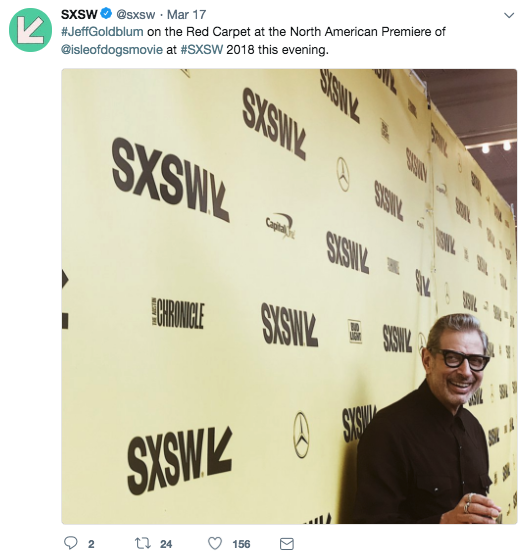 South by Southwest utilizes the hashtag #SXSW for all of their content on Twitter, from music performances to red carpets. PREPAREDNESS IS A TEAM SPORT. As Howard Ruff once said, “It wasn’t raining when Noah built the ark.” Make sure you brainstorm all your needs and build a coverage kit ahead of time. Our team never leaves to cover an event without a phone, chargers, camera, tripod, stabilizer (useful for live video), etc. If you’re covering a concert or live music/comedy event, make sure you have a contact at the event venue for questions. It’s also important to reach out to the artist’s publicist ahead of time to confirm their photo and video policies. You’ll likely need a media credential or photo pass to not only enter the venue but to do any filming of the event. Does the location have accessible Wi-Fi? If not, think about bringing a mobile hot spot to upload and post your photos in real time. KNOW YOUR PLATFORMS AND YOUR AUDIENCE. Are you covering an AARP convention? Maybe not great to cover the event on Snapchat. Is your audience more active on Twitter? Focus on engaging tweets during the event and recap it on Facebook later. Moral of the story: live event coverage brings you to your audience’s level. Whether it’s a concert, a fair, a festival or a conference, you can see how your patrons experience your brand in real-time. You’ll gather feedback from the event attendees, provide real-time customer service and mitigate any issues to provide the best experience for your guests. Most importantly, you’ll show your audience that your brand is as excited to be there as they are. You’ll feel more connected and quickly find opportunities to engage with them in a way that will transform them into brand advocates. After all, that’s the ultimate goal, right?